Turkeys travel in groups and roost in tall trees to avoid predators. November is a time of thanksgiving, and for some reason, the turkey is the symbol of our thankfulness. After President Abraham Lincoln proclaimed Thanksgiving a national holiday in 1863, the turkey gained traction as the meal of choice for Americans because it is a uniquely American bird, and it was known that colonists did hunt wild turkeys during the fall of 1621. Most likely, it also was because it was big enough to feed a whole family and lacked the utilitarian purpose of laying eggs or providing milk, like chickens or cows. Regardless of the road that brought the domesticated turkey to the American dinner table, it has become a symbol for thankfulness. It seems appropriate to take some time to actually be thankful for the turkey and its unique characteristics. 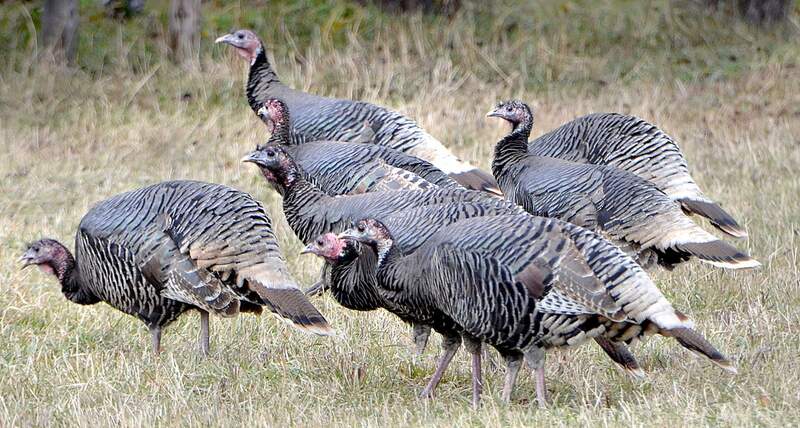 Just having wild turkeys in Colorado is cause for celebration. At the time of the Pilgrims, wild turkeys were plentiful. But, over-harvesting and habitat loss nearly wiped them out by the 1900s. It has been a long road to recovery to build up the population, as well as the habitat to support them. Colorado is home to two subspecies of wild turkey: the native Merriam’s and the Rio Grande, which was introduced to the state in 1980. The Merriam’s wild turkey is primarily found in open meadows and in ponderosa, oak brush and piñon juniper stands in mountainous zones. The Rio Grande species inhabit cottonwood and riparian areas adjacent to agricultural lands in the eastern portion of the state. Young turkeys, known as poults, eat insects, berries and seeds, while adults will eat anything from acorns and berries to insects and small reptiles. Two major characteristics distinguish males from females: spurs and beards. Both sexes have long, powerful legs covered with scales and are born with a small button spur on the back of the leg. Soon after birth, a male’s spur starts growing pointed and curved and can grow to about 2 inches. Most hens’ spurs do not grow. Males also have beards, which are tufts of filaments, or modified feathers, growing out from the chest. Beards can grow to an average of 9 inches. Most of the wild turkeys seen this time of year travel in groups and roost in trees at night. Tall trees make good roosting areas to avoid predators. Turkeys need open and covered habitat for survival. Being large birds, turkeys look a little awkward up high in trees during November, but what better place to survey the landscape that supports them and take a moment to be thankful that they have survived. Maybe they are a good Thanksgiving symbol after all.